Last spring, we spent three weeks exploring Spain, Portugal and Morocco. Throughout those three weeks we kept seeing hints of glorious wildflowers as we traveled through the countries in cars, taxis, trains and buses. We would point to the flowers from the windows as the blooms whizzed past us in a blur of color. Driving north from Marbella to Seville in a rental car, we had finally regained the luxury of stopping whenever and wherever we wanted. As we flew down the highway near Ardales, we saw a flash of crimson to our left. We looked at each other. Should we go back? Yes. Can we turn around here? No idea but we’ll figure out how. A couple miles down the road we exited the highway and back-tracked to a paved road near the red swath. We had a hunch that something wonderful lay just beyond the crest of the hill. We drove up, turned left onto a dirt road, parked the car and set out on foot. 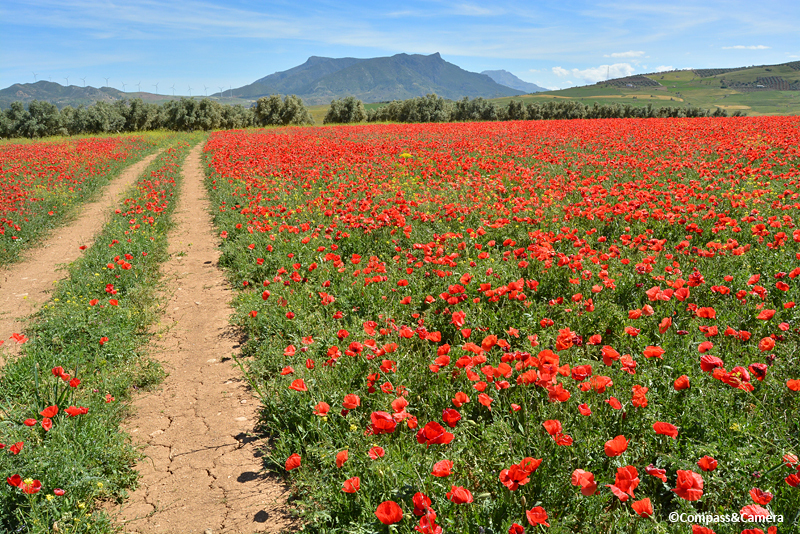 In the first three minutes, J was farther up the hill, knee-deep in bright red poppies, silhouetted against the blue sky along with the wind turbines. 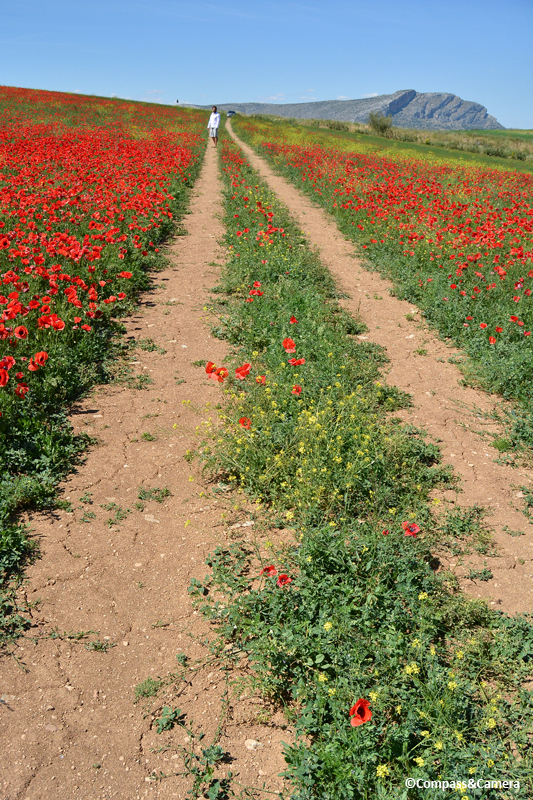 Walking south, the poppies intensified. Their dotted mass blotted out the stems underneath in a pointillist’s gradient from green to red. The sight was overwhelming, unexpected, spectacular. If we had not slowed down … if we had not been looking … if we had not been curious … if we had not been willing to change direction … we would have missed it. Barely in view, just beyond reach … a divine gift waiting to be discovered, marveled, and ultimately left behind in every way except memory. What a memory. On this Thanksgiving, I’m grateful for the divine gifts in my life — a wonderful family, a super adorable husband and travel partner, exceptional friends around the world, a life and career I love, and all of YOU who find something in my writing that compels you all the way to my final words, right here and now. Thank YOU! Happy Thanksgiving! Right?! Nature’s best gift! Thanks, Anita! And thank you Kelly for this wonderful post. Gorgeous photos! What serendipity that you glimpsed the flowers, and then turned around. I love sweet travel moments like this. It reminds me of Don and I following some backroads in NZ because I wanted to get closer to some pretty rolling hills and we came across a huge (as in hundreds) herd of deer. Simply breathtaking Kelly. Thanks for sharing this special moment and thanks for turning back. Hope you had a Happy Thanksgiving day. Warm wishes as always. Beautiful post Kelly! We are thankful for you and the window to the world you share so eloquently ……..
Brenda! Wonderful to hear from you! Thank you so much for your lovely comment! Hope you and Frank had a great Thanksgiving with the family! xoxo, K.
Thank you so much, Andrew! We celebrated Thanksgiving a little early, last weekend. Made a turkey and all the trimmings — just like home! Happy Thanksgiving, Kelly! This post reminds me of that freedom I had driving my own car on a road trip across Java more than two years ago. Truly one of the best travel experiences ever! Can you imagine what you could have missed if you had not decided to turn back and investigate that flash of crimson you saw? Thanks, Bama! I guess we would have no idea what we missed if we hadn’t turned around. But that’s why it’s so important to follow your instincts when you travel — stuff like this happens! Your Java road trip sounds super fun! J wants to get a van and drive from Alaska to South America next year. It would be a HUGE trip. This is the first time I’ve said or typed anything about it. Does that make it real? Ha ha! Thanks for sharing your thoughts! Wooow! A road trip from Alaska all the way to South America is EPIC!!! I really hope you and J go with that plan — I’m excited already! Thanks, Curt! Given your blog title, it makes sense that wandering is your preferred way of travel! 🙂 Hope you and Peggy had a lovely Thanksgiving as well! As a brake-slamming, U-turning, detour-taking, FOMO-frenzied traveler (and just plain everyday liver of life), I get you! And how sweet to take your blessings and give them back to us. Hope your Thanksgiving was great! Thanks, Nadhiira! Good luck with your new blog! Nice when life works out that way. 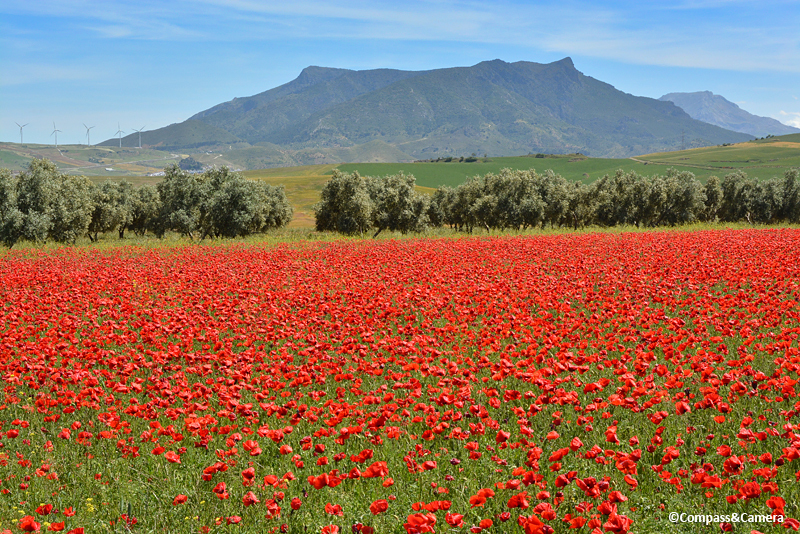 It’s hard to resist a nice flower picture, and a field of red would be hard to pass up. Gives us a little extra to be thankful for. Those hunches while traveling are the best! 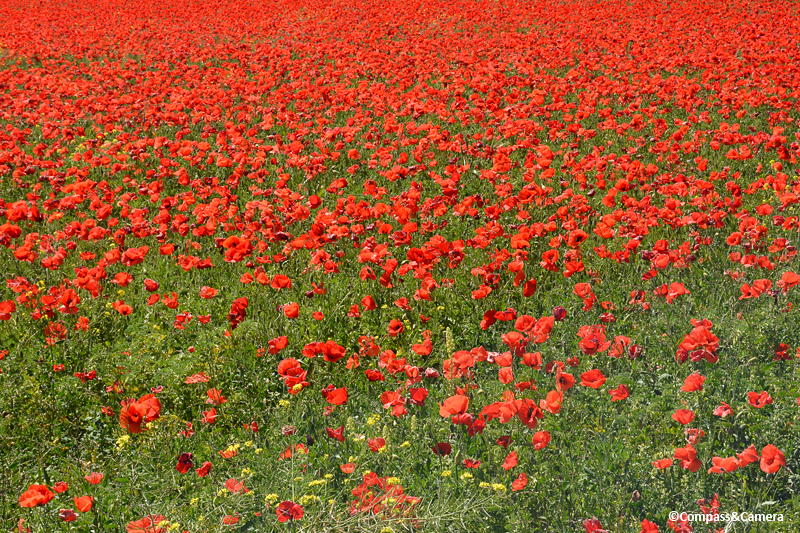 Your glorious poppy field photos have me imagining I’m Dorothy….